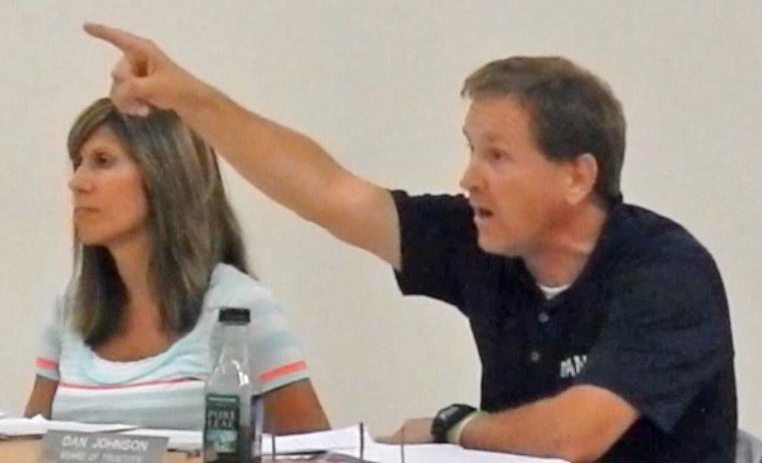 McKINLEYVILLE/ARCATA – With the festering scandal over a plagiarized speech crippling its ability to conduct business, and with the public demanding that action be taken, the local high school board voted Tuesday, Sept. 10, to ask Trustee Dan Johnson to resign. boldt Union High School District (NHUHSD) Board of Trustees came after a tense meeting at which a defiant Johnson lashed out at critics, called them “haters,” criticized the superintendent’s job performance and accused a fellow board member of posting “hurtful” comments about himself and his family on the Internet. More than 140 people packed into the McKinleyville High School Multi-Purpose Room to hear the board discuss the issue, which has plagued the district since Trustee Johnson gave a plagiarized speech at the Arcata High School graduation ceremony on June 13. Last week’s meeting began with public comments similar to those heard at the last two meetings. Residents said the board needed to take action and do something about Johnson’s plagiarized speech. But there was also a strong contingent of Johnson supporters, who rallied behind the embattled board member. About half of those who spoke said it was time to “move on” – a term that saw frequent use – that Johnson had made a mistake and apologized. His good deeds and dedication to the district should not be forgotten, they argued. After hearing public comments, the trustees began their deliberations determined to resolve the controversy and put the issue behind them. They also repeatedly defended their actions and responded to public criticisms that they had failed to act and, in doing so, had coddled their fellow board member with special treatment. “It’s taken so much time and so much energy out of people for such a long time. It’s a very serious matter,” said Trustee Dana Silvernale, who requested that the issue be placed on last week’s agenda. Silvernale said the trustees hadn’t had an opportunity to sit down together with Johnson and discuss the issue. She said she didn’t feel it was right for the board to take a stand without first having a conversation on the matter. Board President Mike Pigg also defended the board’s actions. He noted that after the graduation speech, Superintendent Chris Hartley and Trustee Dan Collen went on vacation. “It was very hard to move faster than we did in addressing this issue,” Pigg said. When they returned from vacation, a special meeting was held on July 26, during which the board approved a process to try to prevent such incidents from happening at future graduation ceremonies. “Still, that didn’t satisfy the public, it didn’t satisfy the media. And some board members still had a hard time not hearing from Dan Johnson.” Pigg said. Pigg acknowledged that Johnson’s failure to address the issue early on made matters worse. “One of the roles of the board is to communicate with the public. And if there’s anything Dan has let down in his role, is not communicating with the public,” Pigg said. When Johnson finally did issue a public apology in July, it fell short of board expectations. In particular was the final two sentences in Johnson’s apology, which were repeatedly referenced by trustees at last week’s meeting. This didn’t sit well with Pigg. “I’m going to speak for myself. I don’t think it was the greatest apology. I wasn’t very happy about the last line. It wasn’t a good comment from a board member,” he said at last week’s meeting. Johnson’s apology, Pigg noted, did not put the controversy to rest. “So with the help of the media, things kept growing and growing,” Pigg said of the summer speech scandal. Apparently, Pigg had additional conversations with Johnson with the hope that the board member could issue a proper apology and resolve the issue. “I spoke with Dan and I asked if he could listen to the comments and he could issue a statement. That’s what the board member needs to do. I hope we hear that statement tonight,” Pigg said. But when it came time for Johnson so speak at the meeting, his latest apology was anything but contrite. “First of all I’d like to apologize to the board for missing the August meeting. As many of the board members and administration know, I was dealing with a pretty intense personal issue with my family that took complete priority over this board during those months, so unfortunately I was unable to make the July meeting and./or the August meeting,” Johnson said. At this point in Johnson’s apology, someone in the audience was talking and laughing. Johnson looked toward the north side of the room and directed comments at someone who he believed was a teacher, although later he admitted he couldn’t see who had disrupted his comments. “You can give me the respect to listen to what I have to say, this teacher, because I can tell you right now if someone was sitting in your classroom laughing while you’re lecturing, you’d probably send them out,” Johnson said. At that, he raised his arm and pointed toward the door. “So why don’t you head out of the room right now and go stand in the hallway while I speak and have my opportunity to talk. Thank you,” said a visibly angry Johnson. He then continued his commentary, which seemed to suggest that his critics in the room, many of whom were teachers, parents and students, weren’t doing enough for the schools. “I urge you all in the room to run for the board. I urge you to get on a committee. Get involved in a classroom. Put some passion into the school, and actually see if you can make a difference in a kid’s life, like everyone of these board members who are on here have made,” Johnson declared. Johnson then cited David McCullough Jr. (referring to him as “McCoughlin”), who gave the original “You Are Not Special Speech” that Johnson plagiarized, as one of those people who gave him “input.” Johnson also cited numerous influential businessmen like Bill Gates, as well as friends and family members for giving him inspiration. “I find it disheartening that people so quickly forget all the wonderful things that people do in their life and they jump on the controversy. I guess that’s human nature, certainly not my human nature. We’ve all learned from this. The district and the board has listened and acted on your concerns. It is time to move on and focus on improving the already exceptional district and educating and providing extracurricular activities for the experience of our kids here in the Northern Humboldt Unified [sic] School District. Thank you,” Johnson concluded. The audience bursts into a thunderous applause. Numerous people rose from their seats and gave Johnson a standing ovation. Johnson’s feisty apology and his lashing out at critics didn’t go uncommented by fellow trustees. But before the board got down to trying to resolve the issue, some trustees felt compelled to again defend their actions over the last three months. As for accepting Johnson’s written apology, Toste clarified that the board accepted his statement at the forum and into the minutes, rather than the content of the apology. “That’s it,” she said. As for calls that the board make Johnson resign, Toste said the board doesn’t have the legal authority to do so. “To look at us as not taking action, or coddling Dan, is completely wrong. He hasn’t been coddled, he just doesn’t want to resign. Why not censure, people say. Many people have been speaking loud and clear that they want Dan to resign and think that a public condemnation of Dan’s speech will get that result. They don’t know Dan Johnson,” Toste said. Trustee Dan Collen said that Johnson has been a good board member and provided the district with lots of expertise. “He did apologize. I accepted his apology,” said Collen, who agreed that the last paragraph in Johnson’s written apology should have been left out. But Dana Silvernale had a different take on Dan’s apology and his conduct, which she said appears to violate the board’s governing standards. Board members, she said, are supposed to keep the district focused on learning and achievement for all students. The board has lost that focus as a result of Johnson’s speech and his response to critics, she said. “It’s been how many months now that our focus has been on Dan’s speech?” Silvernale asked. Board members, she said, are supposed to operate openly with trust and integrity. “I think we have. I don’t believe we violated the Brown Act,” said Silvernale, referring to allegations that the board violated state law by holding numerous secret meetings via e-mail and possibly telephone calls, during which a quorum of the board tried to figure out how to handle the scandal. According to Silvernale, Johnson violated this policy. Silvernale then referenced the earlier incident in the meeting when Johnson told someone who he believed to be a teacher to stand in the hallway for interrupting his apology. “That comment really makes me question whether you can be trusted to behave in a civil and respectful manner and to really listen to what everyone has to say,” Silvernale said to Johnson. Silvernale said that while there were people early one who were calling for Johnson’s resignation, there were others who wanted to just hear a sincere apology and who would be willing to move on. “What can you do, Dan, to make things right for our community?” Silvernale asked him. She asked Johnson how he was going to be able to effectively serve as a board member at events, like the ribbon cutting ceremony for the new bleachers at McKinleyville High School scheduled for Friday, Sept. 13. “You have a lot of people who are upset and very distrustful of you. What’s it going to be like?… How can you be an effective and joyful member of the board in that kind of environment?” Silvernale asked. “I’m not in a position to answer those (questions) tonight,” Johnson responded. Moving closer to a resolution, Trustee Toste made it clear who she would be representing when making a decision. Later, Toste said “What I hear people saying is that we either need to hear a sincere apology from Dan, or he needs to resign.” Her statement was greeted with applause. President Pigg found himself in an awkward position of having to criticize a Johnson, with whom he went to high school and considers a personal friend. “There’s been trust that’s been broken, a loss of trust with our staff and our kids,” Pigg said about the situation. Pigg said he also has a hard time with Johnson’s tone with staff. Next was Johnson’s moment to try yet again to give the kind of apology that board members wanted to hear, but it didn’t happen. Johnson’s final comments were met with applause from the audience, but he’d sealed his fate with the board. Silvernale said that the comments showed that Johnson doesn’t know how to treat other people. She also asked Johnson who the colleague was that posted the comments on the Internet. “Yeah, I was speaking of you,” Johnson said to Silvernale. In an email interview Sunday, Silvernale wrote that she was confused by Johnson’s comments and left the meeting unaware that he had accused her of posting comments about him on a blog – a charge she flatly denied. Silvernale asked Pigg if his comment that the board call for Johnson’s resignation was a motion. Pigg said no, it was just a suggestion. Silvernale moved that the board call for Johnson’s resignation. The motion was seconded by Toste. The board voted 3-1, with Trustee Collen dissenting, to ask for Johnson’s resignation. Trustee Dan Collen said he was a “process guy” and didn’t see the point of asking for Johnson’s resignation. The voters, he said, have the option of voting Johnson out of office when he comes up for election, or they have the option of recalling Johnson. Johnson abstained from the vote and made no further comments. The vote signals board disapproval of Johnson’s performance, but does not require him to resign. This entry was posted on Friday, September 20th, 2013 at 7:37 am	and is filed under News. You can follow any responses to this entry through the RSS 2.0 feed.